I'm creating a multilangue joomla site with English and Faroese. 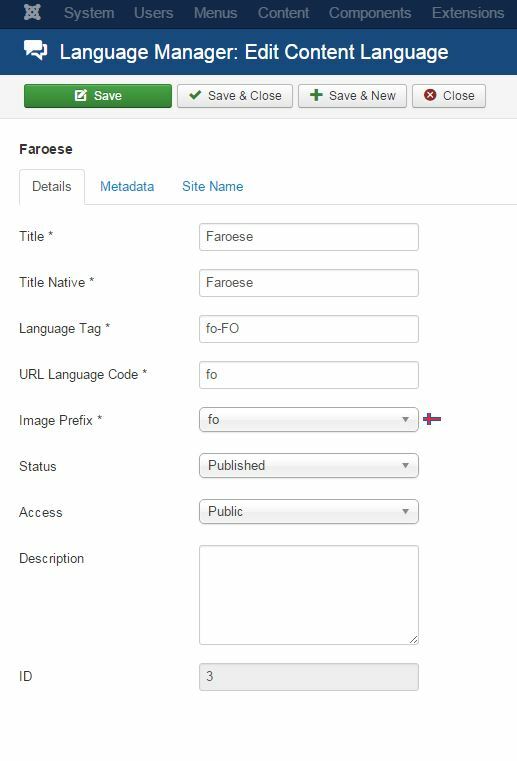 Faroese isn't in the language list, but my site is just made up of articles and menu's that I'm creating at my own, so I don't need to download anything but I want to add Faroese and English to my Content Languages. And have 2 flags up in the right top lettings users change in between languages, just like normal. My problem is that Faroese isn't in the list when creating a new content language. How can I manually add it or somehow get it available? You need to create a Languaje Content entry for your language. Not the answer you're looking for? Browse other questions tagged joomla-3.4 language content or ask your own question.